DUFFERIN AND AVA, Marquis of, Viceroy of India. 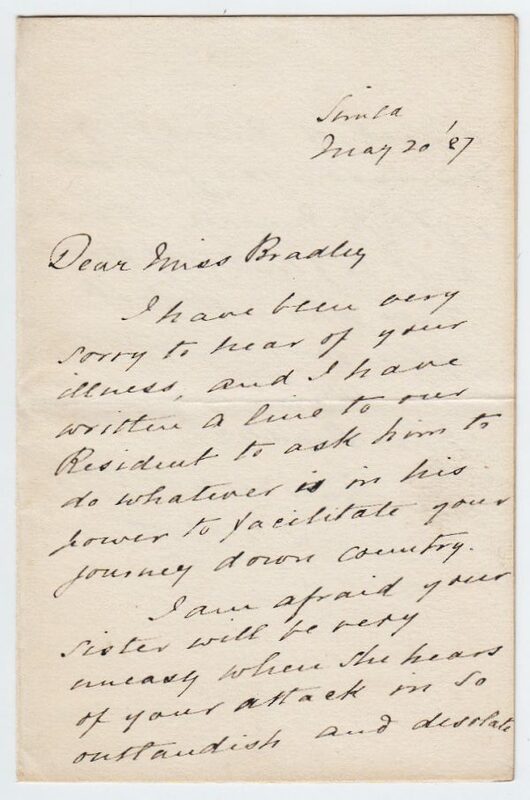 16430 Autograph Letter Signed ‘Dufferin’ as Viceroy, to Miss Bradley, referring to the illness she suffered “in so outlandish and desolate a part of India”. 2 pp. 7 x 4½ inches, fine. Simla, 20 May 1887. “if, however, you get all right to Murree there will be plenty of people there who will look after you.” Frederick Temple Hamilton-Temple-Blackwood, 1st Marquis of Dufferin and Ava (1826-1902), diplomat and administrator, was Governor-General of Canada (1872-78), Viceroy and Governor-General of India (1884-1888).